Have we gone too far in enacting laws, promulgating regulations and announcing policies that threaten freedom of association, either now or ‘in waiting’ for the future? 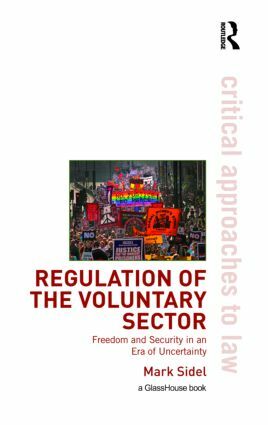 Regulation of the Voluntary Sector focuses on the legal and political environment for civil society in an era in which counter-terrorism policy and law have challenged civil society and civil liberties in a number of countries. The ways in which counter-terrorism law and policy affect civil society can and do differ dramatically by country and region. Through the lens of developments since September 11th, Mark Sidel provides the first comparative analysis of state responses to voluntary sector activity. Comparing the situations in the UK and the US, as well as in Australia, Canada, India and within the European Union, he surveys the increasing efforts to delimit and restrict voluntary sector activities – such as fundraising and grant-making – as well as opposition to them.